Like most babies, these new arrivals require a lot of attention. While they wait in their incubators for one of their 16 daily feedings, they listen to the recorded voices of their parents. They are fed a special formula of papaya, scrambled eggs and insects. Insects? 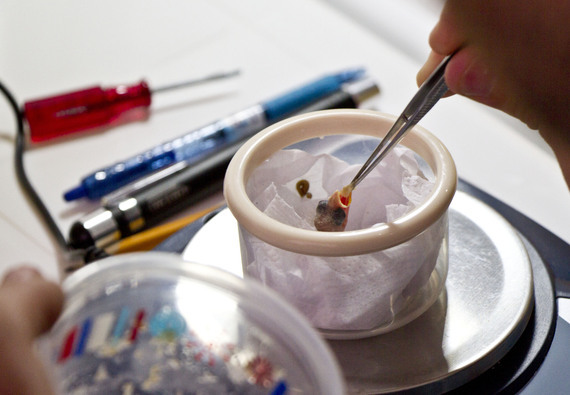 Mangrove Finch Hatchling being fed at the Darwin Foundation in Santa Cruz island. That's because these are not human babies but rather birds-Mangrove Finch hatchlings. The intensive care they're getting is designed to save their species from extinction. The finches of Galápagos are the birds that helped inspire Charles Darwin's theory of evolution. There are thirteen species of finches on the islands. But now, six of those species are in decline and the mangrove finch population has dropped to between 60 and 80 birds, spurring a major rescue campaign. On the western side of Isabela at Playa Tortuga Negra, the Galápagos National Park, the Charles Darwin Foundation and the San Diego Zoo have joined forces to ensure that the critically endangered Mangrove Finch will have a future. "It took three years of planning to get where we are today," said Francesca Cunninghame, a scientist with the Darwin Foundation who is in charge of the operation. The biggest threat to the finches is a parasitic fly, Philornis downsi, whose larvae infest the tiny bodies of newly-hatched birds, feeding on their blood and tissue. 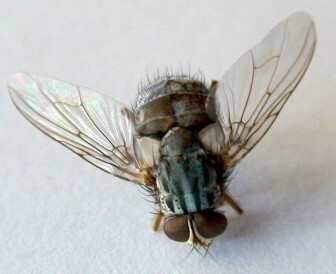 First recorded on the Galápagos in the 1960′s, the fly is now found on almost every island in the archipelago. 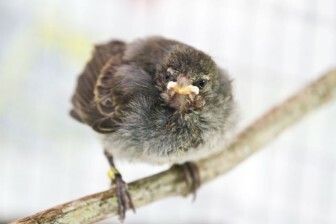 It wasn't until the 1990′s that scientists began to study the fly's impact on birds, an impact that decimated the populations of finches, particularly the Mangrove Finch. On Isabela, park personnel and scientists have been climbing through the mangroves, grabbing eggs out of nests and hatching them in incubators to protect the tiny hatchlings from the fly infestations. Francesca Cunninghame (R) and other members of finch rescue team examine eggs taken from nests. To date, 13 chicks have been hatched in captivity. The young birds will be hand-reared and then released into a sort-of halfway house, an "acclimation aviary" on Isabela, before being returned to the wild. Scientists describe it as a "head-start program" for the young birds. Since early February, the teams have collected 21 eggs and three newly-hatched chicks. The teams employed medevac techniques normally reserved for war zones to rescue that trio of newly-hatched birds, all of them infested with fly larvae. "We got Q-tips with Vaseline," he said, "and smeared it on their nostrils and ear canals." Then, he said, the fly larvae, deprived of air by the petroleum jelly, crawled to the surface where technicians removed them with surgical forceps. Of the first three finch hatchlings treated this way, two survived. "The San Diego Zoo team," Switzer said, "Is very excited to collaborate in this critically important project to prevent the extinction of the Mangrove Finch." 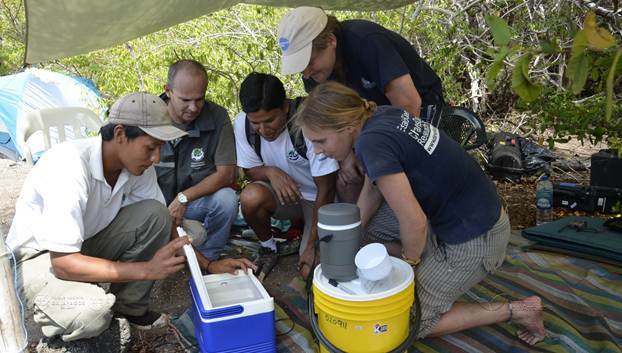 The visiting scientists are training Ecuadorians to carry on the work in the coming years. "Being able to share these skills for the conservation of Galápagos' biodiversity, " said Switzer, "is a wonderful opportunity." The cooperative venture drew high praise from Ecuador's Minister of Environment, Lorena Tapia. "Because of the geographical scale of the problems we face," she said, "joint efforts are required for the conservation of a species that is seriously affected." 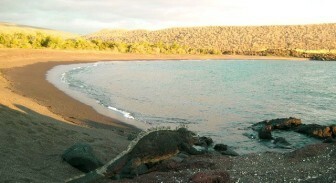 Playa Negra beach on Isabela island where the Mangrove Finches nest. "What we've achieved is a huge milestone," said Cunninghame, although she cautions that many years of work lie ahead in restoring the mangrove finch population. "The reintroduction of the youngsters back into the wild," she said, "will be our next big challenge." Ultimately, scientists hope to find a method of controlling the Philornis downsi fly although in an ecologically sensitive area like the Galápagos Islands, the widespread use of insecticides may not prove practical. "We face huge amounts of challenges," said Cunninghame.